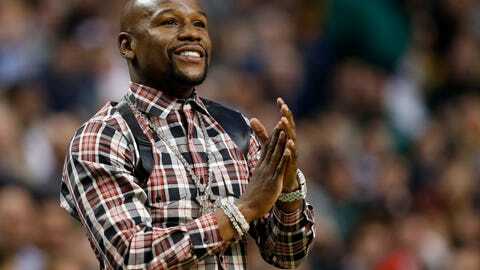 Floyd Mayweather took a few more shots at Conor McGregor over the weekend during a promotional stop in the United Kingdom, and advised the UFC champion that it would be a wise business decision to lose a potential megafight that would almost surely break pay-per-view records. McGregor, meanwhile, has maintained that Mayweather is "petrified" to face him. On Tuesday's episode of "Undisputed," Shannon Sharpe and Skip Bayless reacted to the latest speculation over a McGregor-Mayweather bout, and Sharpe explained why McGregor doesn't have the power to make the fight happen himself. “This guy says that I’m a [expletive], I’m scared, I’m a chicken. 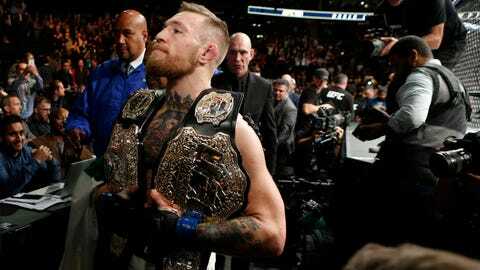 “Conor has looked so good in his last two fights. He’s been phenomenal. 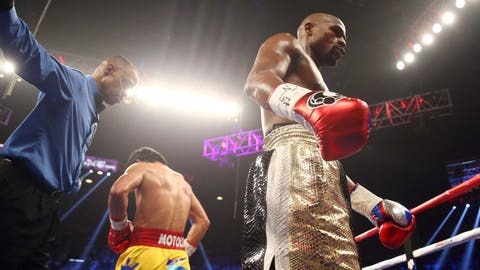 Now, some of that shine — a lot of that shine, almost 90 percent of that shine — if he were to fight again and lose, a lot of that shine would be gone. The people won’t be clamoring for this fight like they are now. “This is not Muhammad Ali vs. ... Skip, you remember when Muhammad Ali and Gorilla Monsoon fought in the exhibition? But this, you have two apex fighters in their respective sports, they’re gonna fight for real. Now, glove size, all that can be negotiated. But for Conor, he has to get this from Dana White. 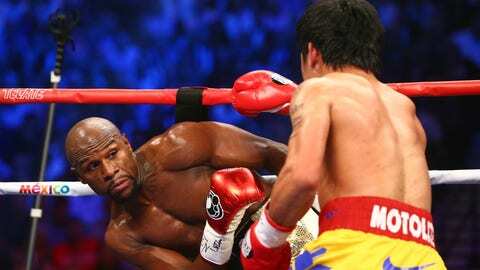 Floyd’s going to want it on Showtime pay-per-view. I’m sure UFC’s going to want it on their pay-per-view station. So how do we get there? And Conor can’t do anything. Conor can do all this yapping all he wants to, but all he’s doing right now is bumping his gums, because unless Dana White gives him his blessing this fight is not going to happen. 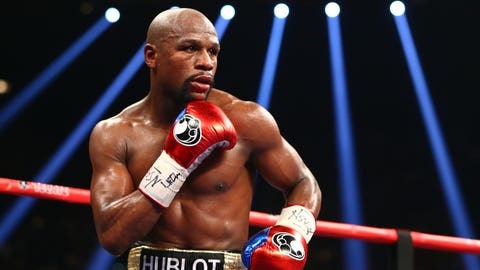 “I think all the yapping, all the bumping of gums is being done by one Floyd May-or-may-not-weather Jr. What’s highly amusing to me right now is that Floyd is so self-absorbed, so egomaniacal because he is so wealthy — more power to him — that he has convinced himself that he is the draw here when he is no longer the draw here. 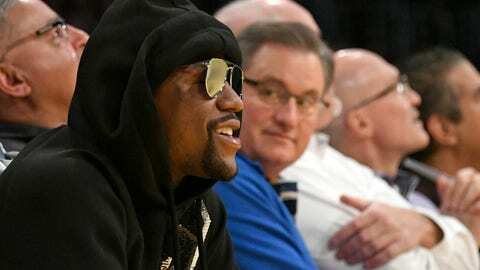 I’m going to remind Floyd if he’s watching, Floyd Mayweather Jr. is starting to look more and more to me like Floyd Sr., because he has turned 40 years of age. And I hate to bring this up, but his last real fight was Marcos Maidana, and that was September of 2014. Two-and-a-half years ago. “Floyd is bordering on becoming a has-been and a once-was. And he’s talking like he’s the big draw when, globally, the far bigger draw is Conor McGregor — the baddest man on the planet. Floyd is lucky that Conor would even consider fighting him. “To your point about ‘He better fight Floyd before he loses in UFC,’ what I love about UFC from the start — the best have to fight the best. You can’t fight tomato cans. You can’t run from this opponent or that opponent, or wait until they’re too old to really stand up against you in the ring. So it’s just head-to-head, head-to-head, head-to-head, at your best, at your best, at your best. “And Conor knows that, and Conor says, ‘Why am I going to potentially lose for $3 million when I could lose and make $100 million?’ If it makes dollars, it makes sense. Skip, you’re potentially looking at a $600 million fight. 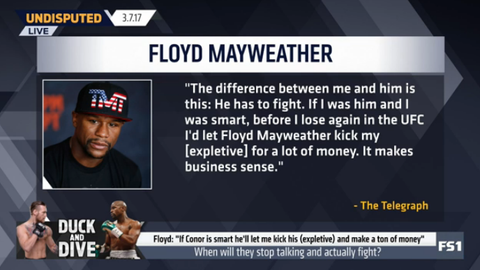 Let’s just say, for the sake of argument, Floyd Mayweather takes $350. 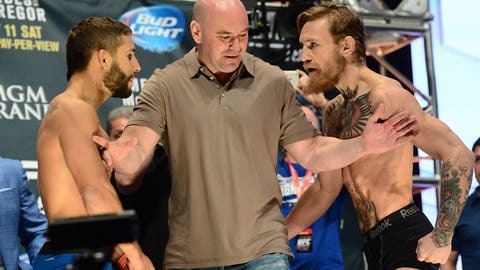 Conor gets another $100 to 150. Let the UFC have $100 million."